These elegant creole earrings are crafted in classic 9ct white gold in a triple oval design. Wear with complementary white gold jewellery for a coordinated finish, or contrast with bright jewel tones for a contemporary colour clash. 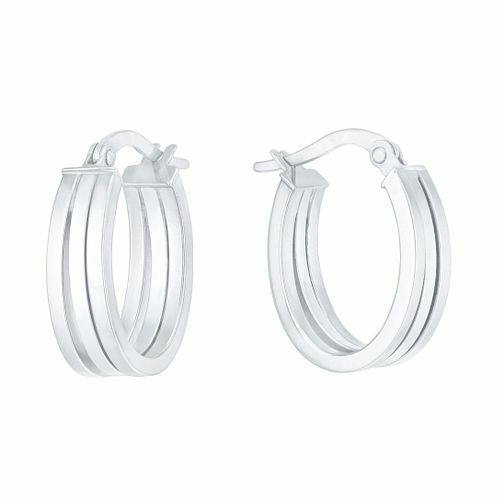 9ct White Gold Triple Oval Creole Earrings is rated 5.0 out of 5 by 1. Rated 5 out of 5 by Anonymous from Beautiful earrings, solidly made Delighted with these earrings which were a Christmas gift from my mum. Although they are creole earrings the triple design makes them really unusual with a beautiful sparkly finish. Fast delivery and well packaged in a nice presentation box.